Spread the word! Band Day is coming up this Saturday, September 9th! 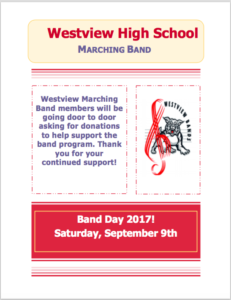 Westview Marching Band students will be going door-to-door asking for donations to support the band program. Donations will help us have music mentors in the classroom, pay for new instruments, pay fees for competitions and overall help support the band program! Students and volunteers, please meet at Westview at 9:30 am. A full schedule will be sent out this week.